A group of professional bonsai gardeners from Tokyo immigrated to this land after the Great Kanto Earthquake in 1923, in search of spacious land, fresh air and ater suitable for making bonsai. Omiya Bonsai Village was established in 1925. The calm scenery of Omiya Bonsai Village has been preserved since the time it was established. 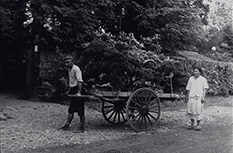 Ritaro Shimizu (Seian) contributed greatly to the establishment of Omiya Bonsai Village. 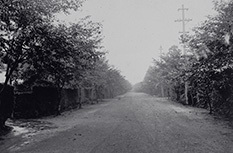 In March 1935, volunteers gathered for the tenth anniversary of the village and erected a monument to praise his achievements. In this picture you can see the completed monument and Seian standing next to it. The name of Omiya Bonsai Village is known all over the world, and along with foreign tour groups, it is visited by overseas bonsai lovers and VIPs from around the world. 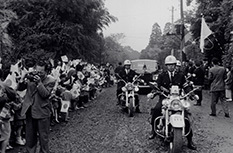 This photo shows children waving the Japanese flag and greeting state guests visiting the village. 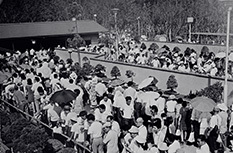 In the Japan World Exposition (Expo) held in Osaka in 1970, the Japanese government presented a bonsai and suiseki exhibition. Most of the bonsai exhibited then were from Omiya Bonsai Village. 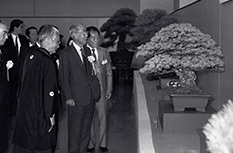 In 1989, the first World Bonsai Convention was held in Omiya City (now Saitama City), Saitama Prefecture. The convention was held for four days and about 1,200 bonsai lovers from 32 countries around the world participated in the demonstrations and workshops, which were a great success. 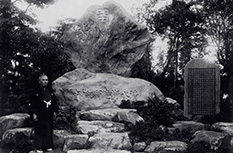 Saburo Kato was the third generation owner of Mansei-en who also served as Chairman of the World Bonsai Friendship Federation, and played an active role as executive comittee chairman of the first World Bonsai Convention. He has also created a number of masterpieces of Yezo-matsu (Picea jezoensis) bonsai exceptionally the forest style and the bonsai with stone.